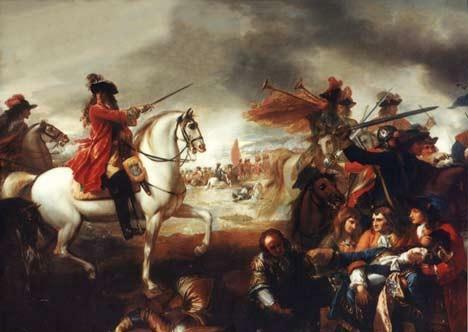 Since the time of Cromwell many Irish people had emigrated to the West Indies and the rate of migration increased after Protestant forces vanquished Catholics at the battle of the Boyne. William of Orange and his English wife, Mary, daughter of James II, both Protestants, were invited to replace the Catholic James II as joint monarchs in 1689 in what came to be known as the ‘Glorious Revolution’. James did not accept his ouster and led an army to try to claim his birthright. 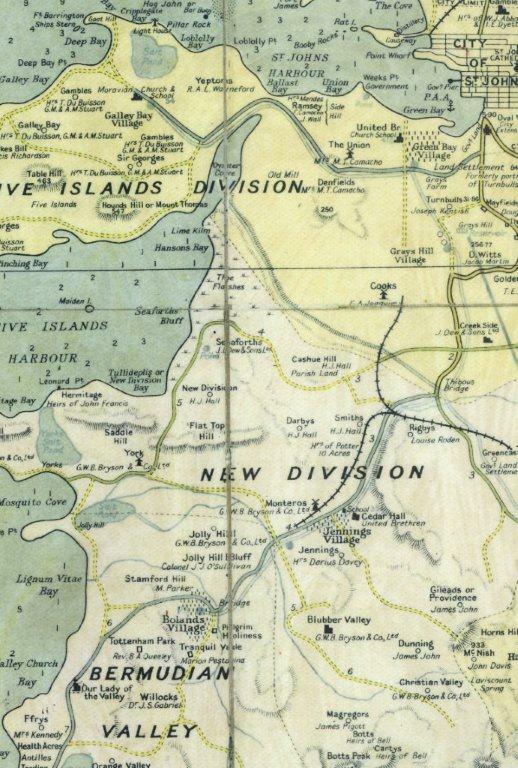 The rival forces met in Ireland in 1690 at the River Boyne. Robert Nugent-Dunbar writes to his son, Arthur, in 1844 describing the marriage beween Walter and Antoinetta. He may have gone there to join kinsmen. An authoritative Irish history says 12,000 Irish people had settled in the West Indies by 1669, including 400 in Antigua. Vere Langford Oliver’s History of Antigua refers to a Thomas Nugent in Montserrat as early as 1678, who by 1684 is referred to as a Member of the Assembly. The earliest reference in Antigua is to Dearby Newgent and Margarett his wife who in 1680 sold 33 acres in Bermudian valley – see map. Darby Nugent – presumably the same gentleman – died in July 1719 and was buried at St Philip’s. Walter, made a total of three voyages to Antigua before settling there and marrying the daughter of a wealthy French merchant. This is the story, drawn from the family pedigree and Oliver’s History of Antigua (both based on the pedigree by William Skey), of the origin of the Nugents of Antigua. It is, however, difficult to believe these accounts completely for if Oliver Nugent of Drumcree was married in 1687, and his grandson, the second Walter, was married in 1721, two generations grew to maturity in the space of 34 years. It is more likely that there was only one Walter, born around 1688, who was the son and not the grandson of Oliver Nugent of Drumcree and Jane Nugent of Dardistown, as V L Oliver suggests. If we believe this version, we can surmise that some time after his marriage to Elinor Cusack (c.1705-10) Walter left Ireland and joined the Imperial army of England in which he served as a captain until c.1718, when he was aged about 30. Soon after this he made the first of his three voyages to Antigua. We cannot be sure what became of Elinor – possibly she died – or whether they had children who remained in Ireland. 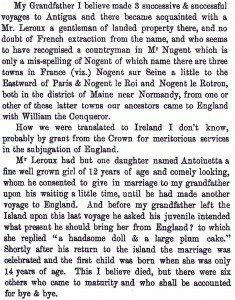 In Antigua, Walter became acquainted with a wealthy French Huguenot gentleman of landed property who seems to have recognised a countryman in Mr Nugent, given the family’s French ‘Nogent’ origins – see letter written by Walter’s grandson. Mr Jacob Le Roux agreed to give his only daughter, Antoinetta, in marriage. Before the marriage, Walter made another voyage to England. Asking his fiancée what he should bring her she replied: “a handsome doll and a large plum cake.” They were married at St John’s church (later cathedral) on 1st July 1721, he then being 33 and she being 12 ½. We must assume, given Antoinetta’s Huguenot upbringing, that Walter had by this time embraced Protestantism. Surprisingly, given the amount of immigration from Ireland, there has never been a Catholic church in Antigua. 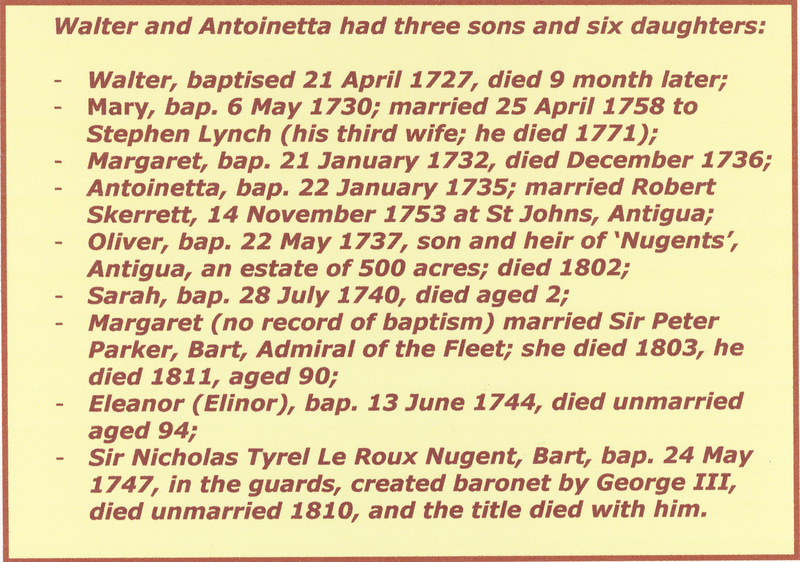 Walter and Antoinetta are the progenitors of the Nugents of Antigua. 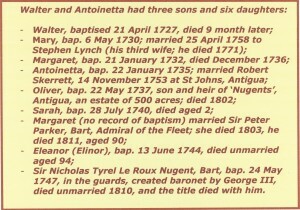 Their first child, also called Walter, born when Antoinetta was just 14, died aged 9 months. Six of their nine children grew to maturity. Three of the daughters, Mary, Antoinetta and Margaret, all married Irishmen. Mary’s husband Stephen Lynch and Antoinetta junior’s husband Robert Skerrett feature in subsequent property transactions with the Nugents – see Nugent Homes and Estates. The oldest surviving son, Oliver, married Elizabeth Dunbar, and in due course inherited both Walter’s and Jacob Le Roux’s estates. In 1724 Walter was a captain in the Antiguan militia, then major and later colonel (prior to March 1743). He lived at Nugent’s, a few miles east of the capital St John’s, where he died aged about 70 and was buried at St John’s church on August 5th 1758 when, it is recorded, he was “carried into church”. Antoinetta outlived him by nearly forty years, inheriting 20 sheep, 3 cows, a coach, chaise and 4 coach horses, and 52 acres called Dennings and the house thereon. She died in 1794 or 1795. Walter and Antoinetta’s heir, Oliver, was born c.1737. He inherited land from both his parents and is credited with having built Clare Hall on ‘Nugents’ 500 acre estate. He had one son and two daughters (Robert, Mary, Barbara) by his first marriage, to Elizabeth Dunbar, and two sons and one daughter (Nicholas, Christine, John) by his second marriage to Bridget Lynch. He became a member of the council – the first indication of a Nugent taking a role in governing the island – before moving to nearby Dominica in 1773, being declared bankrupt in 1777. He died in North America in 1802. Of Oliver’s children, only Robert, the eldest child of his first marriage, and Nicholas, the eldest child of his second marriage, had any offspring of their own. 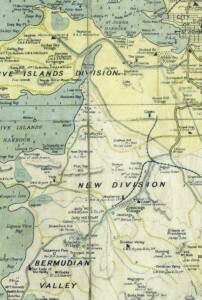 Robert added Dunbar to his surname, becoming Robert Nugent-Dunbar, apparently as a condition to inherit lands from his mother at Marchermore, Kircudbrightshire, south west Scotland. 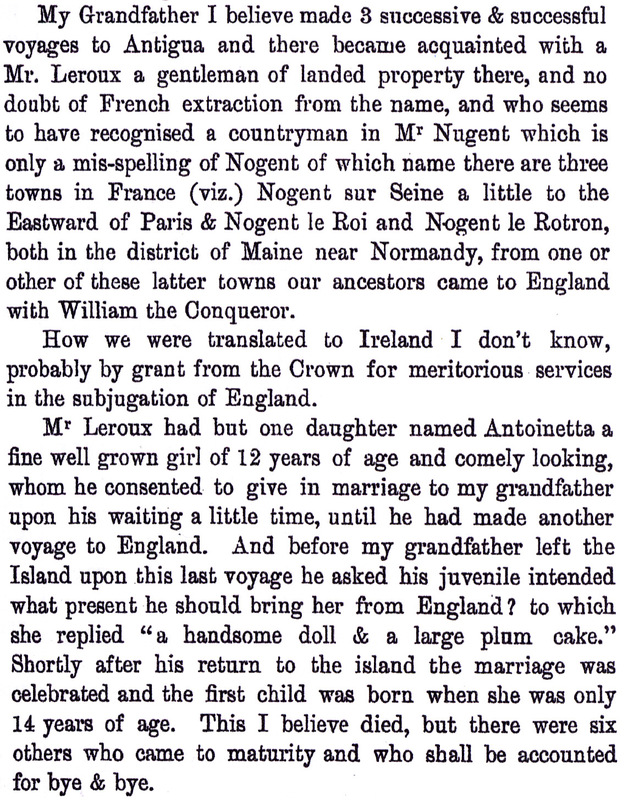 The Nugent succession passed to Oliver’s son, Nicholas, whose life is chronicled on a separate page. Nicholas bought or inherited back the Nugent/Skerrett estates from his cousin, John Lynch, Antoinetta Skerrett’s nephew – see Nugent Estates and Homes.